Thanks Gerald for an email on property investing in South Africa. just talking about prospects and possible investment vehicles. Sorry Gerald, I blog almost anonymously. I have tried to give myself a name Sisa, which is shortened blog name. I am looking forward to following your blog. I haven't met many South African personal finance bloggers. I also congratulate you on your apartment. The area will always be important. The economic part of your question is easier to answer because we can always consult our statistics and bank indices. 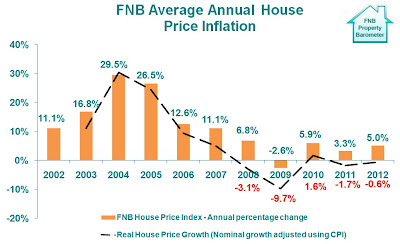 Below is the house price index by the FNB. It shows some 5% growth in house prices in nominal terms. However, in real terms, the price inflation was in the negatives (-0.6%). Well, since I suspect that you are planning to hold onto your property for a while, you shouldn't be shaken by that. 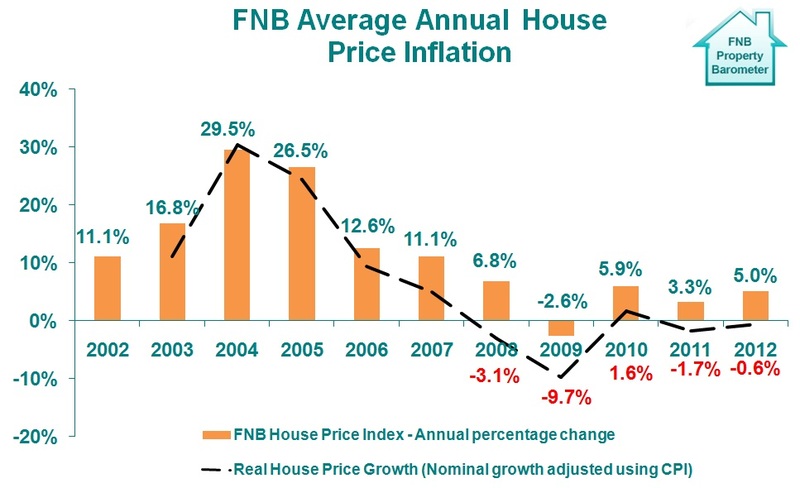 Over time, SA property values have had an upward trend. The challenges are on tenant issues, maintenance costs and home owners association fees. Rental rates usually follow the value trends. I have noticed with my own properties that there is no shortage of tenants. I think that has a lot to do with the National Credit Act and Regulations (NCA and NCR). Most people don't qualify for homeloans and are forced to rent. Its important to note that this high quantity of tenants is not necessarily of a high quality. There is a lot of dodgy tenants out there. 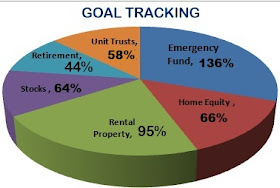 The one fact is that real estate investing is never passive. It takes a bit of work from you, whether you have a property manager or not. You actively look out for your investment. Make sure your apartment is of high value, well maintained, well insured, well looked after, rental rate is just right, etc. You have to make it your business and pay attention. Another important fact is that, your investment is not liquid. You cant act quick and dispose of your investment when things go wrong. This is every investor's fear. I have thought about selling everything several times but got back to the choice of sticking it out. Its mainly because real estate is a passion to me. But the risks will always be there. One reason I have kept going is the power of leverage which is unique with real estate investing. If one can build wealth using the bank's money, it makes it very attractive. Looking at the political climate: BIG sigh. An optimist in me thinks that our investments are safe. But in reality, we don't know. I sometimes think paying up my properties was not very wise. I now carry the risk alone. It would be better to carry it with another party, like the bank. But I must say the net income is much better without the mortgages. I had to work towards DIVERSIFICATION to reduce the impact of risk. I intensified on my stocks, which I must say was scary earlier on in my life. I encourage people to start with index funds like satrix to start warming up to the idea of stocks. Check their website (satrix.co.za). My very young son has some SatrixIndi stocks. The past year saw that particular fund grow by 39%. That's a great deal. I am hopefully adding some bonds by the end of 2013 or beginning 2014 too. This is low risk and therefore lower return. The interest rates we enjoy in SA are not seen in most countries. I know when we factor inflation, those rates are in the negative in some cases. I also stash my cash in the money market. Nedbank's Just Invest that I use is at 4.65% at the moment. That's the money market kind of account. All SA banks have the money market account. Some people invest in coins, gold, fine arts, etc. I never got into those but some people claim to get high appreciation from them. Whatever I collect is not for investment purposes. I never even factor my household goods like furniture and art in my net worth.